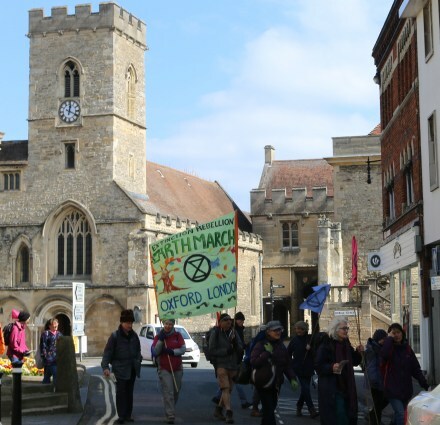 Marchers began a five day walk from Oxford to London to raise awareness of the Climate Emergency. They arrived in Abingdon at lunchtime and had a meal at St Ethelwold’s House before leaving for Wallingford where they stay overnight. Ginnie Herbert is one of a group of determined grandmothers who was part of the march. Others of all ages had joined her. The marchers have an urgent plea to those in positions of power ‘to listen to the voice of the People. We are marching for the future of the land beneath our feet, our winding rivers, our shorelines, the oceans and the very air we breathe. They call it a pilgrimage for the planet. 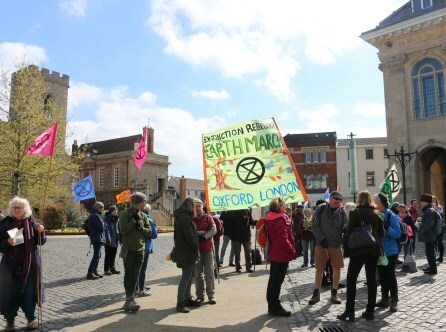 It will end in extinction rebellion in London. Tree huggers are so out of touch these days. A worthy cause, but threatening to bring mass disruption to the London transport system isn’t surely the way to go? How many of these people have ‘Made in China’ stamped on most of what they own? How many have ‘Made in India’ on their clothes labels? Massive industrialization of huge production economies like China and India absolutely dwarf our UK carbon footprint by a factor of 20…0r nearer 30. Avoiding adding to that CO² footprint would be better than turning our TV off of standby…. John Styles; I’m not really sure what point you are making. However there was an article in the Guardian about similar to what I said, so I concede I’m wrong. I now wash my yoghurt pots and also turn my TV off stand by. I look forward to the kids doing their “algebra sit-in” for the environment.